Hey guys, Dan Thomas from Image Doctor and Improvemant.com and watch the video above or read the article below to learn some MEN’S SKIN CARE TIPS. Do you remember when the term metrosexual was splashed across every men’s magazines and used as a derogatory term in locker rooms, change rooms and office cubicles. Hopefully the men of 2015 realise that this archaic term was used by men who were to cool to care about their appearance and you now realise that the man who doesn’t make an effort to dress and groom himself well is the man who has less professional and social success. An important factor in presenting a well-groomed and attractive appearance is the condition of your skin, which is particularly the case with your face so today I am giving you 10 men’s skin care tips to help you out in the important area. 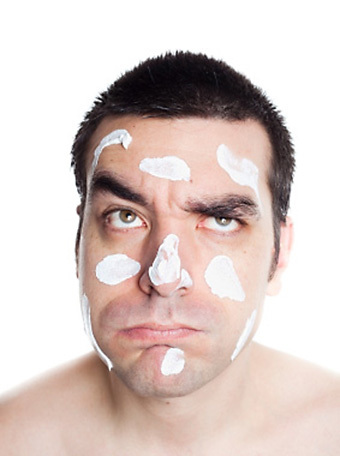 Men’s skin care tip number one is to limit the amount of sun exposure you are subject to. Even in the winter months and overcast days, your skin is still exposed to ultraviolet rays that damage your skin and cause premature wrinkles, lines and aging. An often overlooked or unknown fact is that your car windshield does not fully protect you from these harmful rays and this can become a serious problem if you drive for a living or more than the average person. If you work outside and are in direct sunlight then ensure you are wearing SPF 30+ sunscreen and if you your sun exposure is less frequent but still semi regular such as driving during the day, walking to and from the station or walking during your lunch break, I advise you use a moisturising cream that includes sunscreen as an active ingredient. Men’s skin care tip number two is wear sunglasses when driving and anytime you are exposed to the sun. The skin around men’s eyes is the weakest and most susceptible to sun damage and premature ageing through wrinkles and lines. One of the most common signs of ageing or sun damage are crow’s feet that develop next to the outside edge of your eyes which you can see here in this image. By wearing sunglasses when exposed to the sun, you will avoid the premature development of these crow’s feet and maintain a more youthful appearance. Men’s skin care tip number three is to use a cleanser to wash your face every day. When I say cleanse and wash your face every day, many men may feel they are already doing this by washing their face with traditional soap during a shower. This is a big grooming mistake as traditional soaps and gels are most often filled with chemicals that will actually dry out and cause irritation to your skin instead of making it appear more healthy looking. When I have a shower, I wash the areas below my neck with soap or body scrub and don’t touch my face or neck and when I get out of the shower, the first thing I do is clean my neck and face with a product called Witch Hazel. Witch Hazel is a great multi-purpose ointment and I have included a previous video I posted in the description field below which lists 15 different uses for this great product. In terms of your skin, Witch Hazel is a cleanser, toner, moisturiser and astringent all in one. Using Witch Hazel after a shower means you will remove the dirt and grime from your skin whist retaining moisture and necessary oils. A skin toner means your skins pores will be shrunk in size and an astringent means the skins tissue and cells are actually constricted. The result of both these factors means that your skin will appear firmer and more taught which will result in you looking younger than you actually are. Also, you are best to use an alcohol free Witch Hazel product which is more favourable for your skin. Men’s skin care tip number four is to moisturise your face morning and night after you have cleansed your face. You are best to use a moisturizer that is free of oil and made with as many natural ingredients as possible. Men’s skin care tip number five is to drink ample amounts of water each day. Not drinking water regularly causes dehydration which dries out your skin and promotes premature ageing. Drinking ample amounts of water in the region of two and a half to three and a half litres per day will result in clearer, fresher looking skin that is hydrated and healthy. Men’s skin care tip number six is to maintain a consistent sleeping pattern of around seven to eight hours of sleep per night. Doing so will allow your skins cell’s the required time to rest and rejuvenate and ward off premature lines and wrinkles. Men’s skin care tip number seven is to eat ample vegetables. One of the countless benefits of consuming plenty of vegetables is how the vitamins and minerals found in these vital life sources will create healthier, brighter looking skin and also eyes. Men’s skin care tip number eight is to limit the amount of alcohol consumed within your diet. Drinking alcohol regularly will dry out your skin and affect the moisture levels within your skin cells which can deteriorate your skin over time. Men’s skin care tip number nine is to avoid smoking cigarettes as this is very damaging to the health of your skin along with the many other negative health effects. The presence of tobacco decreases blood flow in the body which directly affects the oxygen delivered to the skins cells and the amount of moisture present on the surface of the skin. And Men’s skin care tip number ten is to avoid having long, hot showers as the prolonged heat and steam will significantly dry out your skin, remove the essential oil from within your pores and cause your skin to be dry, irritated and not as healthy in appearance. So you now have ten solid men’s skin care tips to consider and implement within your daily skin care and grooming regime to ensure that your appearance is as strong as possible and you don’t look younger than you actually are.